STS-114 mission specialist Stephen Robinson floats inside Discovery's payload bay during the first spacewalk he and mission specialist Soichi Noguchi will perform during Discovery's flight. This story was updated at 4:28 p.m. EDT. HOUSTON - Two astronautsare safely back inside the Discovery orbiter after a successful Saturdaymorning spacewalk where they tested new shuttle repair techniques and repairedfaulty hardware on the outside of the International Space Station (ISS). Despite a one-hour delay atthe start, STS-114 astronauts Soichi Noguchi andStephen Robinson strolled through almost seven hours of activities that rangedfrom the much-anticipated test of shuttle heat shield repair techniques to agraceful ride on the space station's robotic arm. The crew even had time to geta jump on the two remaining spacewalks for their flight during their six hoursand 50 minutes outside Discovery. "You guys did anawesome job and it's been a real treat," said astronaut Michael Massimino, capcom for NASA's ISSmission control here at Johnson Space Center (JSC). "We look forward todoing it a couple more times." The astronauts stagedspacewalk - the first for both men - from Discovery's airlock, going oninternal spacesuit power at 5:46 a.m. EDT (0946 GMT) and cracking the hatchabout 15 minutes later as the Discovery-ISS stack passed over Southeast Asia. "You're actuallyflying over Australia now," said STS-114 mission specialist Andrew Thomas,an Australia-native and choreographer for the spacewalking astronauts, shortlyafterward. 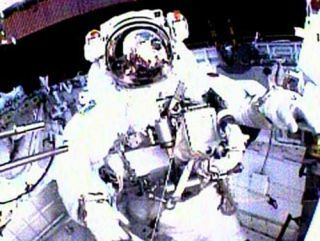 Spacewalk planners opted touse the shuttle's airlock instead of the U.S.-airlock in the space station'sQuest module, after contamination there affected stored spacesuits. While thatproblem has been solved, mission planners chose to not to change their egressplans for the STS-114 spacewalks. Once the Quest airlock wasopen, the STS-114 crew shut the hatches to Discovery's airlock, repressurized it and again opened the hatches between theorbiter and space station. The move allowed Discovery pilot James Kelly andmission specialist Wendy Lawrence access to the space station's robotic arm foruse during the spacewalk. "We're finally inspace," said Noguchi, who served as lead spacewalker during theextravehicular activity. The years of training forthe STS-114 mission saw Noguchi and Robinson, as well as their fellow Discoverycrewmembers, rehearse their mission's spacewalks 70 times - where typical crewspractice between five and seven times per EVA - in NASA's massive NeutralBuoyancy Laboratory swimming pool. "It's slightlydifferent from the pool," Robinson said. The first major tasks forNoguchi and Robinson were tests to evaluate new materials to repair shuttletiles and reinforced carbon carbon (RCC) panels inorbit. The tests were a direct result of the 2003 loss of Columbia, whichdisintegrated over Texas after sustaining heat shield damage its crew had noway of evaluating, let alone repairing. Robinson started off with ablank, putty-like material known as non-oxide adhesive experimental (NOAX),applying it with the space equivalent of a caulk gun and smearing it onintentionally cracked and gouged RCC samples with a spatula. "It's just likespackling," Robinson said while testing his first panel. "It's a lotlike pizza dough. Like licorice- flavored pizza dough." Noguchi used the handheld Emittance Wash Applicator to test a gray substance - the wash- that he both daubed and brushed on intentionally damaged sample tiles. Thewash is designed to help damaged tiles shed heat more efficiently as theyencounter reentry temperatures. "The brush is easy tooperate and I think I can get good coverage," Noguchi said. The astronauts did notperform the heat shield tests on samples to be sent to NASA's arc jet facility,where they were to be subjected to the searing heat experienced by duringatmospheric reentry. But that option was always secondary to the spacewalk's other goals, NASA officials said. "This was primarily anon-orbit test of the materials," said Cindy Begley, lead EVA officer for the STS-114mission. "What we were primarily looking for was how [they] behaved." Engineers on ground willprod the samples returned by the STS-114 spacewalkers to evaluate theireffectiveness, first by non-destructive means and later by slicing them intopieces to see how far the NOAX and wash permeated the RCC panels and heattiles, Begley added. Both Robinson and Noguchireported seeing not as much bubbling in their respective repair materials as theydid in tests back on Earth. And while the NOAX and emmitancewash were not the cleanest to handle, they weren't as bad as anticipated. "We expected them to bemessier," Begley said. Robinson and Noguchi wereoriginally slated to also test a backpack-mounted tile filler system dubbed thecure-in-place-ablator-application (CIPAA), which mixes two materials togetherinto a pink goo called STA-57.That pinkish material is designed to be applied to a damaged tile, then riselike bread during reentry and ablate away, protecting the damaged area. But thematerial's propensity to bubble in vacuum, which could lead to voids whenapplied that would weaken the repair, promptedengineers to hold back in the flight test. There are two CIPAA unitsaboard Discovery just in case they are needed, NASA officials said. After completing the heatshield repair tests, Noguchi and Robinson began a full docket of ISSmaintenance and construction work. First on their list was the installation ofan External Stowage Platform Attachment Device (ESPAD) outside the Questairlock, which Robinson reached via an assist from the space station's roboticarm. "Vegas, there are nowords for how cool this is," Robinson told Kelly, who is known as 'Vegas'and controlled the arm. "This will be a good memory, Soichi." "It is a strongone," Noguchi said. After some difficultymating the attachment device to its location, then locking it down with bolts,Robinson expressed elation. "How you like themapples," he said to flight controllers. "We copy, we likethose apples," replied astronaut Michael Massimino,serving as capcom at NASA's Johnson Space Center inHouston. Following the successfulESPAD installation, Robinson rerouted power for Control Moment Gyroscope 2(CMG-2), one of four gyroscopes that make up the U.S. portion of the spacestation's attitude control system. While the gyroscope itselfis functional, its power source has experienced problems and already undergoneone repair by ISS astronauts. The STS-114 spacewalkers will completely replacea faulty gyroscope, CMG-1, that broke down in 2002. That gyroscope replacement,which Robinson arranged tools for near the worksite today, will completelyoccupy their second spacewalk on Aug. 1. The two gyroscope fixeswill allow ISS controllers to shutdown still a third gyroscope, CMG-3, which isgiving off abnormal vibrations that engineers attribute to the additional loadof the shuttle Discovery's docked presence. Together, the ISS and Discoveryweigh about 300 tons, and may be putting a strain on the gyroscope. While Robinson tended toCMG-2, Noguchi swapped out a broken global positioning system (GPS) antenna onthe station's S0 truss. The two astronauts then joined up to connect cablesthat will provide heating for the spare parts that will eventually reside onthe external stowage platform. The crew even had time fora few extra tasks. Robinson picked up a pairof Materials International Space Station Experiments (MISSEs)from the exterior of the ISS. The activity was scheduled for the third EVA ofthe STS-114 mission. Meanwhile, Noguchi photographed a loose thermal blanketjust under the commander's window atop Discovery's crew cabin. During that time, pilotJames Kelly conducted additional inspections with the orbital boom sensorsystem of Discovery's left wing leading edge, isolating seven areas spreadacross four RCC panels on the orbiter's port wing leading edge. "I believe we'reflying over Houston," Thomas told flight controllers during spacewalkoperations. "Look up. I'm waving." Today's successfulspacewalk was the 59th EVA conducted to maintain the ISS and the 26th stagedfrom a U.S. space shuttle.